SO YOU WANT TO PRETTIFY YOUR BLOG? Big news debut here at Triple Max Tons, dolls. This past weekend, I decided to take a little leap of faith and open up shop. Not an actual shop, but a little custom blog design studio that lives in a brightly lit little corner of my apartment. 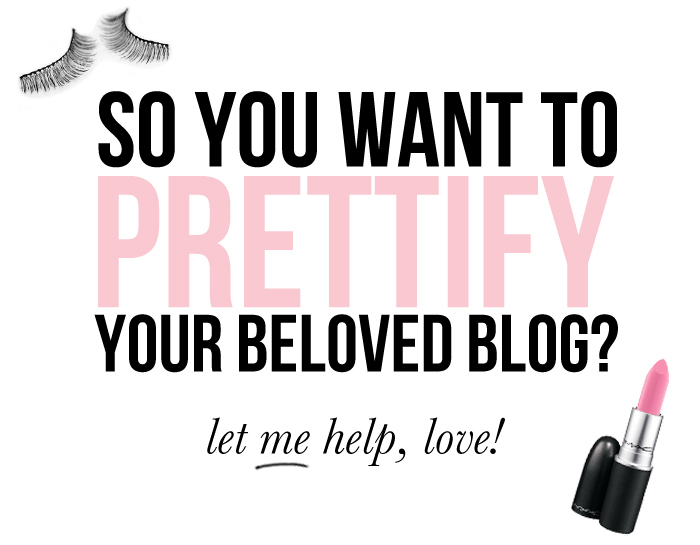 I'm dubbing it "So You Want To Prettify Your Blog?" corner- a phrase I have found myself saying a lot when talking to friends and family about it. It's a little scary putting myself out there since everything I know is self-taught, but I've got spirit and style and that counts for something! It's also a little nerve-racking since design generates intense opinion and blogging can be such a deeply personal matter. I feel like my blog is my little baby, and I am protective and proud of it. I want everyone to share that sentiment with me - your blog is your little corner of the Internet where you can talk about whatever you want, to whomever you like, whenever you like. I believe the blog design is just as important as the content, and the way it looks ought to reflect your sentiments. First impressions count a lot when there are over a million gazillion trillion blogs to sift through. Sure, there are people out there that are bigger, more experienced, and do amazing work...but everyone has got to start somewhere, and this weekend I decided I was going to give it a shot. I have to admit, I am really happy to go on this journey - the creative process, the growing pains, the (hopefully) happy clients, it just makes me giddy with excitement. I'm brand spankin' new on to the scene so my portfolio is limited, and I have hopes that it will grow soon. Like, right after I hit the 'publish' button, haha. So, consider this my call to the faithful few who would like me to help make their blog prettier! Oh, and I should mention, for now I'm just working with Blogger-based blogs (sorry, Wordpress wunderkinds). Check out kirstenstoddard.com for info and rates! Gosh, I need to switch to Blogger. Congrats girl! I've love to hear your rates. I'm kfent21@gmail.com if you feel like sharing them. I can't say for sure I am ready to make a change, but your blog is so well done that I'm very curious!! talent,beauty and guts...the world will be a better place. congrats and best of luck with this new venture. let awesomeness fly!!!!!!!!!!!! I'm a big fan of your blog. My sister and I have a blog together and talk about these types of feelings all the time. Congratulations for putting yourself out there. Hope it exceeds your expectations! Aww, thanks Jenni! It's a bit scary, but you don't get anywhere by just wishing it will happen. So...out on the tightrope I go. As for my blog, I designed pretty much all of the elements on my blog but had some help with the coding a while ago. But now that I have it all figured out, I am good to go! Great idea! I'm glad you decided to take the leap. To anyone out there interested I emailed Kirsten for advice in starting out my blog with a ton of questions. She was not only helpful in answering all my silly questions but she also offered design advice and designed my blog for me! Good for you! I've been debating the same thing about offering design services, but I have yet to build up the courage to do so. Your work looks amazing! Best of luck! Cheers on the new shop!